Another Pinterest success! That website is a never ending jackpot of great recipe ideas. This was a quick and easy weeknight meal. I served the shrimp over angel hair pasta with broccoli on the side. We haven't introduced shellfish to the little one yet since I'm paranoid about food allergies, but this seems like something she'll really enjoy when the time comes! 1. Preheat oven to 400 degrees F. In an 8x8 glass baking pan combine olive oil, lemon zest and thyme. Olive oil should liberally cover the bottom of the pan, if it doesn't drizzle in a little more. Season with salt and pepper. 2. Bake for 10-12 minutes, checking every few minutes, if it looks like it is getting too brown remove and proceed to next step. Meanwhile cook pasta, drain and toss with a pat of butter or olive oil. 3. 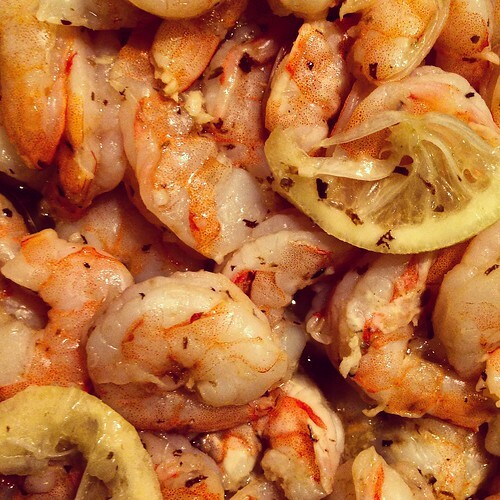 Remove pan from oven, add butter and move it around a little to melt, add shrimp, garlic and the thin sliced lemons (don't squeeze them), toss to coat with oil mixture. Bake for 8-10 more minutes or until shrimp turn pink and just start to curl, check often. 4. Serve over pasta, couscous or rice tossed with additional extra-virgin olive oil and fresh-squeezed lemon with additional lemon wedges for serving.